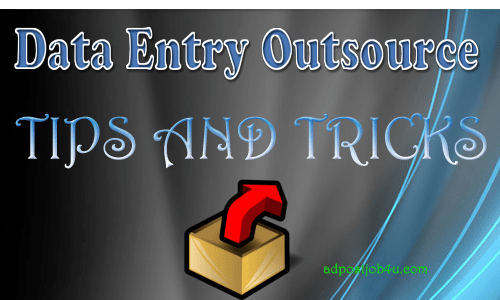 Data Entry Outsource How to find a best one? How can I find a data entry outsource project that make payment on time? It’s a cost-effective program while most of the company use to outsource their data entry project to other. It’s a two ways understanding of Data entry service Provider and Data Entry Project, Provider. Due to low infrastructure and freelancer employee shortage, most of the company outsource their data entry project to someone else having good infrastructure and quality employee for data entry jobs. Data entry outsources is a two-way cost-effective program. There are rock and roll for Data entry outsources as it too cost effective. Suppose Some has a company with IT niche then their employee should well repute for IT management, Software Programming, Coding etc. , So in that case, If they have surprised Data Entry Jobs the employee may be an uncomfortable due mismatch of their niche. In fact, it’s too expensive while a Level 3 Software programmer doing simple data entry jobs for their company. So here is the solution by outsourcing those surprise data entry project to other. It’s a two-way Understanding – The Company having deference niche except typing employee can find a solution to complete their data entry project by outsourcing other. And the Data entry service providers can easily find consignment for their employment as well as a freelancer. A data entry service provider has professional employee and well infrastructure that make project combination for data entry outsourcing. 10 Tips to judgment an awesome data entry company in India. 10 Thinks to Consider before Select a data entry service providers company. Find in Outsource Directory: before the sign, a data entry outsources you need to know how many projects are available in Markets. To find them visit some of popular Outsource Directory. Always create list and intact with those company. Use LinkedIn: Did you have a LinkedIn profile? If no then create a LinkedIn profile and Update your requirement for data entry outsources. Try to highlight your company infrastructure and employee details clearly so that you found an impression to data entry project Provider Company. Get hire in freelancer.com: Millions of small business is growing each day on freelancer.com. Get update your niche to theirs. Create an alert and contact them who offering data entry consignment. If possible create a premium profile in freelancer.com, freelancer.com automatically connect those people or company currently get a match with infrastructure. Switch to Govt Project: Almost 36% of entire data entry works are from Govt. office. Try to address them and get the tender. Use Data Capture Application: do you know almost 85% of data entry can be converted in plain text using OCR Software. Its save you time and resolved your employee shortage problem as Data Capture Application does not require any human effort. You can read here- How can I use Data Capture Software for 10X faster Data conversation Jobs. It’s a major problem that most of the company can’t balance between data entry outsource projects with their infrastructure. Most of the times the consignment gets delay due to staff shortage or accuracy rate get down disappointingly. It kills your reputation and the project data entry outsourcing make a ship from your company. So make a balance of your infrastructure. Try to major daily typing skill of your entire employee and remove the holiday from your contact period. Don’t try making any unusual commitment. Just do work as per your niche and ability. Surely it makes balance and success came up. So, How did find a real data entry outsource projects for your company? Should I miss any useful topic that you want to share with us? Let me know in the comment section how you manage data entry outsource companies?